Poetry Foundation’s winter/spring 2015 events season ranges from a screening and discussion of David Grubin and Bob Holman’s film about lost languages to a theatrical performance of the poems of playwright August Wilson to a talk by former NEA chair Dana Gioia. Join us for ongoing programs such as the monthly Open Door Readings, which mix emerging and established poets from Chicago’s great writing programs, and the weekly Wednesday Children’s Poemtime. Be sure to also visit the Poetry Foundation gallery for art exhibitions featuring Trevor Winkfield, Cheryl Pope, and The Chicago 77, a collaborative poem drawn together from Chicago’s 77 community areas by Fatimah Asghar, Krista Franklin, Fo Wilson, and Jamila Woods. The following events are free and open to the public on a first come, first served basis. These fall events take place at the Poetry Foundation, 61 West Superior Street, Chicago, unless otherwise specified. More information about our events is available at poetryfoundation.org/programs/events. Images are available upon request. Join Richard Blanco, the fifth inaugural poet of the United States, Brad Coley, director of the forthcoming documentary Las Chavas, and Cheryl Chapman, executive director ofOur Little Roses, the only all-girl orphanage in Honduras, for an evening of poetry and film at the Poetry Foundation. The program features a reading and a screening of an excerpt from the documentary about the lives and work of Our Little Roses. Celebrate Willie Lin, the winner of this year’s Drinking Gourd Poetry Prize, a first-book award for poets of color. Lin’s poems have appeared in Bone Bouquet, Cincinnati Review, Washington Square Review, and other journals. Judge Chris Abani has received a Guggenheim Fellowship, among many honors, and is currently a Board of Trustees Professor of English at Northwestern University. The evening includes a performance by composer, producer, and double bass player Tatsu Aoki. The Open Door series presents work from Chicago’s new and emerging poets and highlights the area’s outstanding writing programs. Each hour-long event features readings by two area writing program instructors and two of their current or recent students. There are over 6,000 languages remaining in the world. We lose one every two weeks. Language Matters with Bob Holman, a film by David Grubin asks: What do we lose when a language dies? What does it take to save a language? In anticipation of the film’s airing on WTTW, join Grubin and Holman, along with poets Peter Cook and Parsino Carlos Peynetsa, for an evening of performances, film clips, and discussion about endangered languages. Presented in partnership with WTTW, Language Matters is a co-production of David Grubin Productions Inc. and Pacific Islanders in Communications. Produced in association with the Endangered Language Alliance. Major funding provided by the National Endowment for the Humanities with additional funding provided by the Corporation for Public Broadcasting, the Arthur Vining Davis Foundations, the National Endowment for the Arts, and philanthropic individuals. The Harriet Reading Series features talks, performances, and readings by poets whose work has appeared on Harriet, the Poetry Foundation’s blog. The series presents both established and emerging poets whose writing finds innovative approaches to the craft of poetry. Jennifer Tamayo, author of multiple books of poetry, is a Colombian-born transnational artist and activist based in New York City. Champions from Chicago high schools recite classic and contemporary poems for the chance to represent Illinois at the Poetry Out Loud National Finals in Washington, DC, in April. Last year more than 365,000 students around the country competed for more than $100,000 in scholarship awards and school stipends. Love, What Language Do You Speak? Please join an international gathering of cultural organizations for a multimedia, multilingual evening of poetry, music, film, and theater in celebration of Valentine’s Day. The Open Door series presents work from Chicago’s new and emerging poets and highlights the area’s outstanding writing programs. Each hour-long event features readings by two Chicagoland writing program instructors and two of their current or recent students. In this performance, based on Margaret Atwood’s novella The Penelopiad, Odysseus’s dutiful wife Penelope takes center stage to do some of her own story-making but must endure periodic choral interruptions and cheeky observations from her 12 maids, who were put to death upon Odysseus’s return. Michael J. Miles, one of America’s greatest clawhammer banjo players, is an avid fan of poetry in performance. Join us for a joyful session of live banjo, participatory poems, rhyming games, and some do-it-yourself troubadouring. This special performance will include poems and songs by Dr. Seuss, Ogden Nash, Shel Silverstein, Bob Dylan, and others. Michael J. Miles’s acclaimed one-man show features the musical and written works of Pete Seeger, Carl Sandburg, Woody Guthrie, Walt Whitman, Johann Sebastian Bach, Mark Twain, and others. Protest, passion, politics, poetry—the banjo is the voice of the people. Ian Spencer Bell writes and choreographs simultaneously, often relying on the music of his poetry to locate an emotional force and guide the rhythm of his movement. In this program, Bell dances Geography Solos, three short talking dances about dislocation, and a new work, not yet titled, based on memories of his childhood home in rural Virginia. Over the past five decades, Robert Adamson has produced 20 books of poetry and three books of prose. Adamson has won all the major Australian poetry awards, including the Christopher Brennan Prize for lifetime achievement, the Patrick White Award, and The Age Book of the Year Award for The Goldfinches of Baghdad (2006). His most recent book is Net Needle (2015). Although best known for his “Century Cycle”of plays detailing the African American experience in each decade of the last century, Pulitzer Prize winner August Wilson began his writing career as a poet. As part of Goodman Theatre’s six-week celebration of his life and career, the Poetry Foundation is pleased to present a special program of Wilson’s poetic writings. Terrance Hayes speaks as part of the spring Bagley Wright Lecture Series on Poetry. The series seeks to provide leading poets with the opportunity to explore in depth their own thinking on the subject of poetry and poetics. A selection of poems by Etheridge Knight will be the basis for Hayes’s discussion exploring the relationship between creativity and constraint. In this special performance honoring the great poets World War I produced and those whose lives it snuffed out, Northwestern University theater students, led by Linda Gates, present the work of familiar writers, such as Wilfred Owen, Rupert Brooke, and Isaac Rosenberg, along with those less well known, including Eleanor Farjeon, Muriel Stuart, and the nearly forgotten African American poets who both served and died in the war. Join editors Kevin Coval, Nate Marshall, and Quraysh Ali Lansana to celebrate the release of The BreakBeat Poets: New American Poetry in the Age of Hip-Hop, the first anthology of its kind. Spanning four decades and representing diverse scenes from across the country, the BreakBeat poets are the real-life documentarians of the late 20th and early21st century, employing traditional and wild-style poetics to narrate a new country and city landscape. Celebrate National Poetry Month with a delightful open house just for kids at the Poetry Foundation Library. This special weekend event will feature a variety of performances, interactive activities, and poetry-related crafts for children up to 13 years old. Haki Madhubuti will introduce a reading by Kelly Norman Ellis, Calvin Forbes, Angela Jackson and Roger Reeves. The event, which will include music and a reception, is co-presented by the independent biannual literary magazine Fifth Wednesday Journal. Internationally acclaimed poet, critic, and librettist Dana Gioia has published four full-length collections of poetry, including Interrogations at Noon, which won the 2002 American Book Award in poetry. Former chairman of the National Endowment for the Arts, Gioia holds the Judge Widney Chair in Poetry and Public Culture at the University of Southern California. The Harriet Reading Series features talks, performances, and readings by poets whose work has appeared on Harriet, the Poetry Foundation’s blog. Writer and critic Jon Leon is the author of The Malady of the Century,Elizabeth Zoë Lindsay Drink Fanta, The Hot Tub, and a number of privately issued titles and special editions. Please join us as we celebrate the first books from two talented young poets. Danielle Chapman is the author of Delinquent Palaces, out this spring from Northwestern University Press. Nate Klug’s first book of poems, Anyone, will be issued in March 2015 from the University of Chicago Phoenix Poets Series. Monday–Friday, 11 am – 4 pm, and during any of our evening or weekend events. Trevor Winkfield has for several decades collaborated with many poets of the so-called New York School. 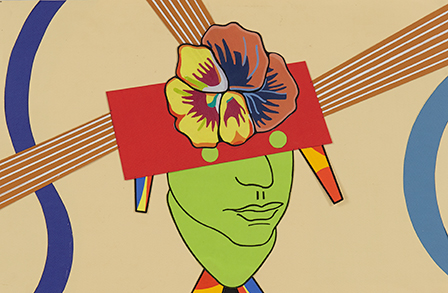 This exhibit comprises original designs of Winkfield’s book covers for such poets as Charles North, Miles Champion, and Larry Fagin, together with limited-edition books done in collaboration with Harry Mathews, John Ashbery, and Ron Padgett. Also included are several striking canvases by Winkfield, including portraits of poets and a large tableau, The Poet and His Muse. This exhibit is presented in collaboration with Tibor de Nagy Gallery, New York. Commissioned by the Poetry Foundation, The Chicago 77 is a 77-line poem comprised of found text and objects from each of Chicago’s 77 community areas. The piece was created by poets and artists Fatimah Asghar, Krista Franklin, Fo Wilson, and Jamila Woods. The completed poem has been printed in a single edition on paper made by artists and Margaret Mahan and Drew Matott. Artist Cheryl Pope will activate various spaces of the Poetry Foundation through installation, sculpture, and performance in collaboration with her team of JUST YELL young Chicago poets.